Summary: Researchers have developed a new robotic exoskeleton system that uses the power of thought control to help move a person’s hand. One in six people will suffer a stroke in their lifetime. In Switzerland alone, stroke affects 16,000 people every year. Two thirds of those affected suffer from paralysis of the arm. Intensive training can – depending on the extent of damage to the brain – help patients regain a certain degree of control over their arms and hands. This may take the form of classic physio- and occupational therapy, or it may also involve robots. 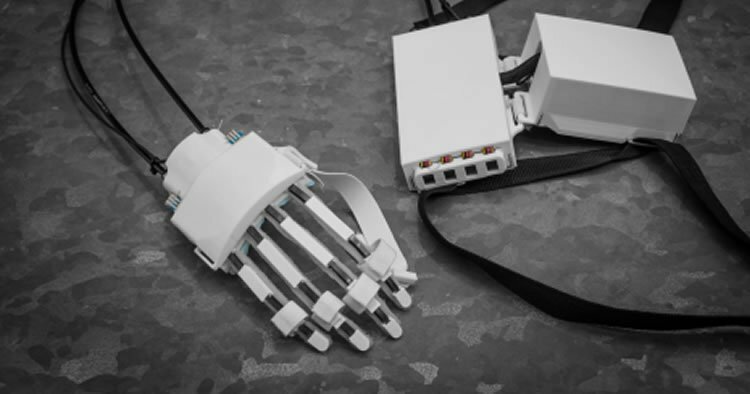 Roger Gassert, Professor of Rehabilitation Engineering at ETH Zurich, has developed a number of robotic devices that train hand functions and sees this as a good way to support patient therapy. However, both physio- and robot-assisted therapy are usually limited to one or two training sessions a day; and for patients, travelling to and from therapy can also be timeconsuming. “My vision is that instead of performing exercises in an abstract situation at the clinic, patients will be able to integrate them into their daily life at home, supported – depending on the severity of their impairments – by a robot,” Gassert says, presenting an exoskeleton for the hand. He developed the idea for this robotic device together with Professor Jumpei Arata from Kyushu University (Japan) while the latter was working in Gassert’s laboratory during a sabbatical in 2010. A hand exoskeleton helps stroke patients to integrate rehabilitation exercises into their everyday lives. Neurosciencenews image is credited to Gerber Loesch. Gassert is currently driven by the question of what happens in the brain and how commands pass from the brain to reach the extremities after a stroke. “Especially with seriously affected patients, the connection between the brain and the hand is often severely or completely disrupted,” Gassert explains, “so we are looking for a solution that will help patients pass on commands to the robotic device intuitively.” The idea is to detect in the brain a patient’s intention to move his or her hand and directly pass this information on to the exoskeleton. This may also produce a therapeutic benefit. According to Gassert, a number of studies show that it is possible to strengthen existing neural connections between the brain and the hand with regular exercise. An important component for this is that the brain receives somatosensory feedback from the hand when it produces a command to move. In order to understand what goes on in the brain, Gassert is carrying out fundamental research with clinicians, neuroscientists and therapists. For their research, the scientists can draw on a number of imaging techniques, such as functional magnetic resonance imaging (fMRI), which allows them to map the activities of the whole brain. A hand exoskeleton with motors that can be fixed to the patient’s back: A bicycle brake cable transmits enough force to lift a litre bottle of mineral water. Credit: Stefan Schneller. While this technology allows them to gain fundamental new insights, fMRI is both very expensive and highly complex and consequently not suitable for therapy. “And of course, it’s not portable,” Gassert adds with a mind to his project. He therefore focuses on simpler techniques such as electroencephalography (EEG) – and in particular functional near-infrared spectroscopy (fNIRS), the least expensive of these technologies. Gassert is currently engaged in the challenging task of figuring out whether and how fNIRS can be robustly employed. He is working on this together with a group from the University Hospital, who are contributing their experience in clinical application of the technology. Another question that is still not fully understood is how the brain controls limbs that interact with the environment. “Here, robotics is making a valuable contribution to basic research because it is ideally suited for capturing a movement, perturbing it and measuring the reaction,” Gassert explains. For example, the robotics experts have developed an exoskeleton that makes it possible to block the knee for 200 milliseconds while walking and extend it by 5 degrees. With the help of sensors, the scientists measure the forces that are involved and use this data to infer how the brain modulates the stiffness of the knee. These findings then flow into applications such as the control of new, active prostheses. If the researchers succeed in establishing an interaction between the brain and the exoskeleton, the result will be a device that is ideally suited for therapy. If, on the other hand, the deficits are permanent, a robotic device could offer long-term support – as an alternative to invasive methods, which are also being researched. These for instance envisage implanting electrodes in the brain and triggering stimulators in the muscles. However, as long as stroke patients can expect to experience a reasonable degree of recovery, the robot-assisted therapy will be the obvious choice. Funding: The study was supported by the National Institutes of Health and the National Multiple Sclerosis Society. Teva Pharmaceuticals provided the drug. Image Source: This NeuroscienceNews.com images are credited to Gerber Loesch and Stefan Schneller. ETH Zurich. “Brain to Robot: “Move, Please”.” NeuroscienceNews. NeuroscienceNews, 22 September 2016. ETH Zurich. “Brain to Robot: “Move, Please”.” http://neurosciencenews.com/neurobotics-movement-thought-control-5108/ (accessed September 22, 2016).